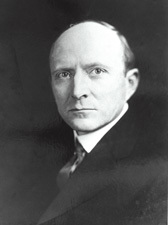 ADAMS, Alva Blanchard, a Senator from Colorado; born in Del Norte, Rio Grande County, Colo., October 29, 1875; attended the common schools; graduated from Phillips Academy, Andover, Mass., in 1893; graduated from Yale University in 1896 and from Columbia Law School in 1899; admitted to the bar in 1899 and commenced practice in Pueblo, Colo.; county attorney of Pueblo County 1909-1911; member of the charter convention of Pueblo in 1911; regent of the State University of Colorado 1911 and 1912; city attorney of Pueblo 1911-1915; during the First World War served as major in the Judge Advocate Generals Department 1918-1919; appointed on May 17, 1923, as a Democrat to the United States Senate to fill the vacancy caused by the death of Samuel D. Nicholson and served from May 17, 1923, to November 30, 1924, when a successor was elected and qualified; not a candidate for the special election to fill remainder of term, but was an unsuccessful candidate for the 1924 general election; resumed the practice of law; elected as a Democrat to the United States Senate in 1932; reelected in 1938, and served from March 4, 1933, until his death; chairman, Committee on Irrigation and Reclamation (Seventy-third and Seventy-fourth Congresses), Committee on Public Lands and Surveys (Seventy-fifth through Seventy-seventh Congresses); died in Washington, D.C., due to heart attack, on December 1, 1941; interment in Roselawn Cemetery, Pueblo, Colorado. U.S. Congress. Memorial Services for Alva B. Adams. 77th Cong., 2nd sess., 1942. Washington, D.C.: Government Printing Office, 1944; Rathgeber, Harold. "The Public Life of Alva Adams." Master's thesis, University of Denver, 1954.